2016 Global Taste of Korea ~ Philippine Freebies, Promos, Contests and MORE! Didn't made the cut last year? The 2016 Global Taste of Korea gives you another chance to show your love in cooking Korean cuisine. Download the application form online and submit it along with a copy of your valid ID/passport and recipe of the dish via email or in person. Additional points will be given to those who will submit a video and photo link of yourself while cooking the Korean dish. Only thirty (30) participants will be accepted on a first come first served basis, so submit your entries as soon as possible. At the competition date, all cooks will be grouped into batches of 10. Each batch will have their own cooking schedule. All basic ingredients, table wares and cook wares will be provided, but you can also bring additional ingredients you will need in cooking your chosen dish. You will also be allowed to have an assistant to help you during the preparation and clean-up time. 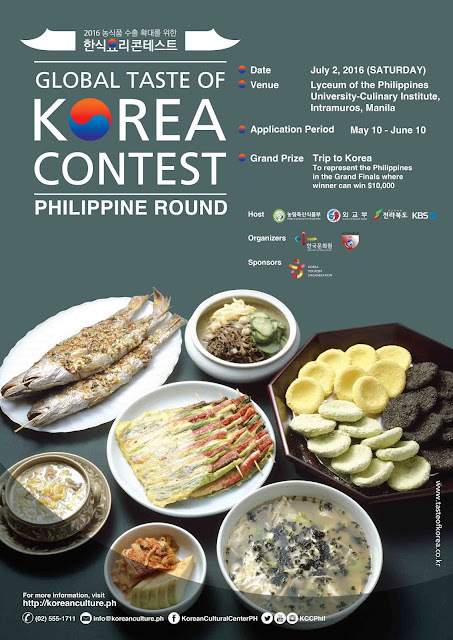 Cook the best Korean food of your life in one (1) whole hour for a chance to win a Trip and Culinary Tour to Korea, P30,000 CASH, Gift Set and opportunity to represent our country in Korea and win the Grand Prize of US$10,000. The Second and Third Place winners will also receive trophies and gift set each along with cash prizes worth P20,000 and P10,000 respectively. For more info, log on to phil.korean-culture.org, email kccphevents@gmail.com with the subject head "[2016GTOK] Inquiry", or call (02) 555-1711.